Disney Goddess: Love is in the Air! 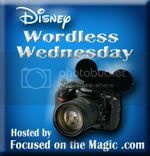 As part of the Wordless Wednesday Bloghop in conjunction with Focused on the Magic , I bring one of my favorite pictures. 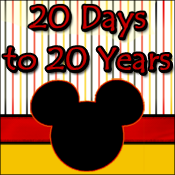 I took this on the 40th birthday celebration of Walt Disney World right after the parade and castle show. Cast members who carried these "old school" Mickey balloons let them go at the end. Against a perfect blue sky, the balloons drifted- as did my mind to memories of my own childhood. Hmmm...You know, you're right! Maybe they needed to stabilize the pressure to keep the ears up! Great picture & video! I don't know either, my theory is that latex is bad for the environment and animals that swallow it once they hit the ground. Also, more people are allergic to latex. Or, maybe because they pop, frightening the kiddies. Great memory, Ami! It's amazing the things moms will do to save the day :) Let us know if you find out about the change in balloon design, I've wondered that myself! Wonderful memory! Thank you so much for sharing it with us. Hugs! Very nice - thanks for sharing!